2010 has been a year of immense change for Brisbane couple Tina and Trevor Lambkin. In April, the Indooroopilly parishioners made a trip to visit Missionaries of the Poor (MOP) in Kingston, Jamiaca, an international monastic order of brothers dedicated to the “forgotten people” of society, the poor, the destitute, the lame and the crippled. This life-changing trip inspired the Lambkin’s to assist the missionaries as they started a new mission on the island of Flores in Indonesia. “About two years ago we started watching EWTN on satellite television and saw the plight of the destitute in Kingston, Jamaica, and the tireless and Christ-like work that the brothers of the Missionaries of the Poor do,” the Lambkins said. “At this, we felt a drawing by our Lord to travel to Jamaica to offer something to the poor and forgotten people of Kingston as a sign of Christ’s love and to witness the exemplary love of the brothers to ‘the least of my people’. “Despite it being only a small contribution on our part compared to the tireless efforts of the brothers, and never having been in contact with the crippled and forgotten, we were not even sure whether we were capable of doing the work that was required of us. The Lambkins assisted the brothers for a week with their mission, but their lives were irrevocably changed by the experience. “We fed them, dressed them, bathed them, shaved them, spoke to them, touched them and held them; mopped, swept floors, cleaned tables, plus more, and despite doing this we received more than what we gave,” they said. “A smile from the people, a touch of their hand or a hug, or merely the opportunity to help them in their crippled condition; this was more valuable than any worldly treasure. 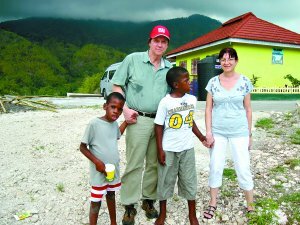 As the Lambkins were leaving Jamaica they were approached by one of the MOP Brothers who was preparing to travel to Flores, Indonesia – an island with an 85 per cent Catholic population – to set up a mission to help the poor. It was an opportunity the Lambkins approached with some trepidation, but they were strengthened by the fact they knew they would be continuing the impressive mission of the MOP. During the first 15 years, the Missionaries of the Poor, founded by Fr Richard Ho Lung in Jamaica in 1981, counted about 10 to 12 brothers. The mission began in Jamaica and spread to Haiti. Then the first house was opened in India, then the Philippines and then to other countries. Today, there are 550 professed brothers and priests, making the MOP one of the fastest-growing orders in the world. There are missions in Jamaica, Haiti, Uganda, Kenya, India, the Philippines, Indonesia and the United States. Perhaps the most remarkable aspect of their work is the funding. Since the brothers take a fourth vow of free service to the poor, they can earn no money. Every dollar, bit of food, and everything else needed by the brothers must come from begging. Despite the lack of funds, the brothers feed about 20,000 poor people every day and have built monasteries, homes for the homeless, a haven to combat abortion, a centre for lepers, a children’s home for orphans in Uganda, a retreat centre and much more across the globe. “It was always been a driving passion, we’ve always said ‘we’ve got to get over to Jamaica’, and this year we went in April and stayed for a week,” Trevor said. “We met Fr Ho Lung and he’s very inspirational … he’s quite amazing. “While we were there these three brothers came up to us and said they were going to Flores on June 5. “I said ‘what’s that got to do with us’. “They said ‘it’s so close to Australia’ and then one thing led to another and they emailed us and basically we felt in our hearts to try and promote their cause. “The objective of their mission is to promote education. Flores is quite Catholic, and it has a significant lower class with very little education. The Lambkins visited the brothers on Flores at the end of October and saw first hand the poverty and malnutrition of the people, but also witnessed the brothers spreading good works and hope. “We took up toothpaste, soap, medication and vitamins for the brothers and the people,” Trevor said. “They have 11 aspirants with them at the moment. Tina said the good works of the MOP would not be confined to the Catholic population or even to just the island of Flores. “They do want to come to Australia to do some evangelising early next year,” Tina said. Tina said a dietician friend of hers, who is not Catholic, had offered go to Flores and set up a nutritional program for the children free of charge. “And she made a donation, and I was just so excited,” Tina said. “The brothers are very excited about that,” Trevor said. “They said ‘that’s what they really need’. Mr Lambkin said the missionaries were struggling to provide the basics of life for people on the island, as food and other essential items were expensive. The Lambkins will head back to Flores armed with more supplies in January. “They are so dedicated, every night they go around and pray the Rosary with families,” Tina said. The Lambkins are grateful of the blessings the work with the missionaries has brought to their lives. “We thank God for opening our eyes to the treasures of working for the Lord through helping the weak and the marginalised,” they said.